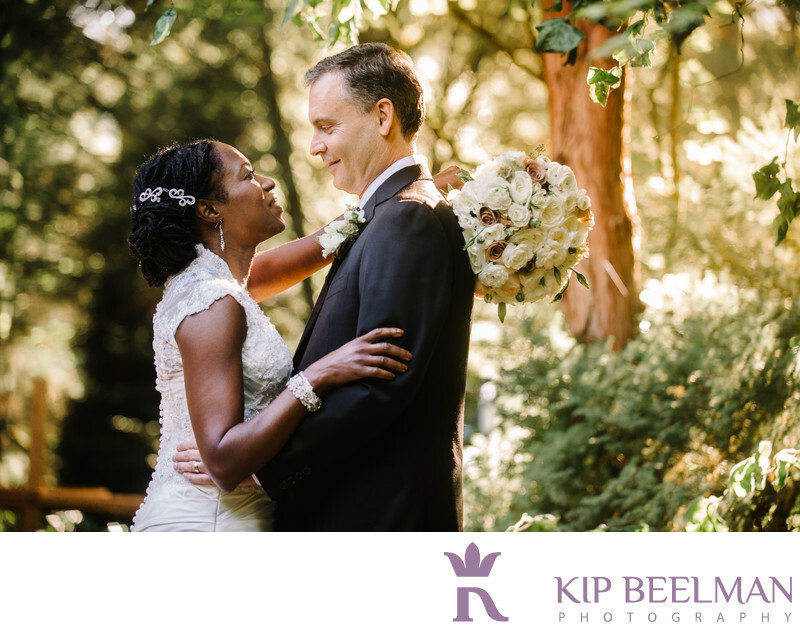 The epicenter of the Washington wine industry, Woodinville, Washington wedding photography allows for some vintage shots and memorable images such as this one. From Kirkland’s Heathman Hotel to JM Cellars, this was a first-class wedding with beautiful locations, a gorgeous ceremony and an intimate reception. You can see that the bride and groom were clearly enjoying themselves in the midst of some stunning natural beauty. The couple got ready and enjoyed their first look at each other at Kirkland’s Heathman Hotel, which brings together luxury and beauty in an upscale boutique location in downtown Kirkland. The ceremony took place outside at JM Cellars winery under a floral arbor and we took advantage of several beautiful locations with gorgeous light streaming through the trees. The winery provided an ideal Northwest backdrop for celebration and fine wine on a seven-acre arboretum known for its rich history and lively present. JM Cellars is located on a hill known as Bramble Bump, which was once part of a 550-acre dairy farm owned by a northwest lumber baron who lost the land in the Great Depression. It was eventually rebuilt, becoming one of the largest dairies in the state of Washington. The owner of the farm gave seven acres to his daughter, who, with her husband, planted 120 Japanese maples and more than 400 rare conifers on the site, creating a dream site for outdoor wedding and reception photography. Thanks to tender care and organic gardening, JM Cellars and Bramble Bump offer couples such as this one the perfect site and perfect vintage for weddings and events. Location: 14404 137th Pl NE, Woodinville, WA 98072. Keywords: Outdoor Wedding (72), Winery Wedding (6), Woodinville (6).